A game of dice and daring in the enchanted forest of Dragonwood. 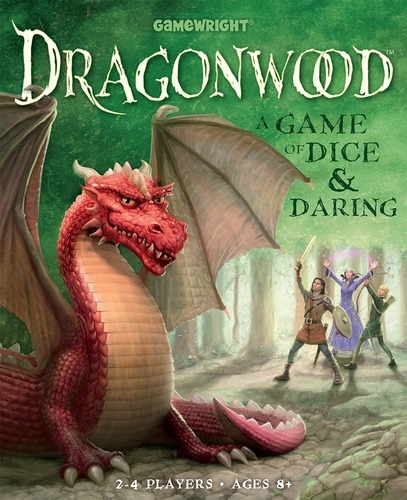 Enter the realm of Dragonwood if you dare! Once there, players will have to use one of 3 types of attacks to defeat the creatures encountered on their adventure. Armed with a hand of adventurer cards you will choose your attack method. Adventurer cards consist of 5 suits of colors numbered from 1 to 12. Playing cards in a numerical sequence activates the Strike attack, while cards with the same number will activate the Stomp attack, and cards of the same color will activate a Scream attack. The number of cards played will determine how many dice you will roll to try and defeat a creature. Each creature has a number assigned to each attack type (Strike, Stomp, & Scream) that must be rolled in order to defeat it, and a victory point value. The 1 victory point Crazy Bats requires a Strike attack roll of 4 or more, or a Stomp attack roll of 3 or more, or a Scream attack roll of 3 or more. The pack of Wolves is worth 3 victory points and requires a Strike attack roll of 6 or more, or a Stomp attack of 7 or more, or a Scream attack of 9 or more. The toughest creature to defeat is the 7 point Orange Dragon which requires a Strike attack roll of 15 or more, or a Stomp attack roll of 11 or more, or a Scream attack roll of 12 or more. On a player’s turn chooses to reload by taking a card from the top of the adventurer deck, or attack one of the 5 face-up creatures. After a creature is defeated a new card is drawn from the Creature deck and placed in the creature line-up. Additionally, the Creature deck contains Enhancement and Event cards. Enhancement cards when captured will give you special capturing abilities on future turns. Event cards when revealed are played immediately and can have positive effects or negative effects on all players. Players must battle their way through the Creature deck to get to the Blue and the Orange Dragons that are shuffled in near the bottom of the deck. When both dragons have been defeated the game is over. The player who defeated the most creatures gets 3 bonus points. Al players add up the victory point values of all of their defeated creatures. The player with the most points wins. 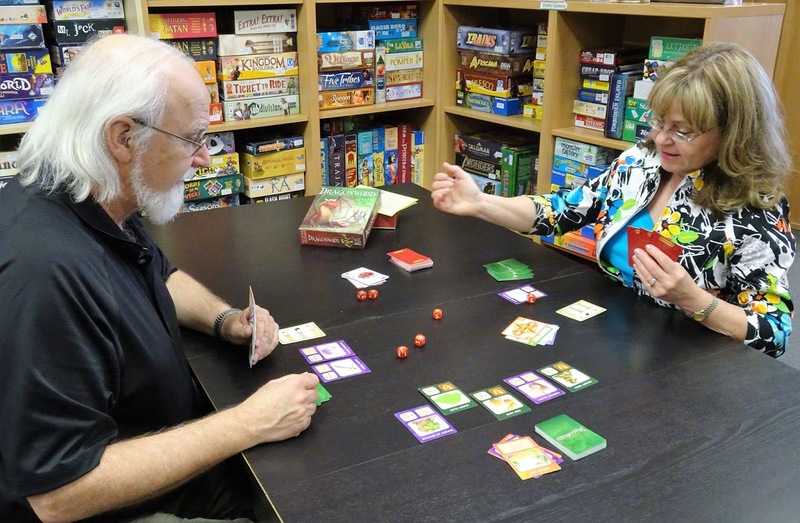 We have an open copy of Dragonwood available in our Demo Games Library for you come in and try.